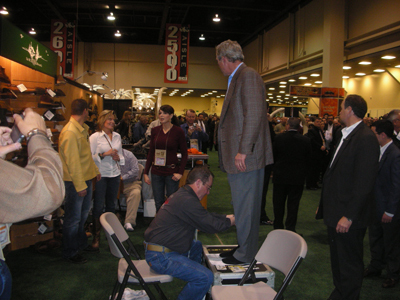 It was brought to my attention that George W. Bush, the 43rd President of the United States, was recently measured for a pair of boots at the 2010 Safari Club International Convention in Reno, Nevada. 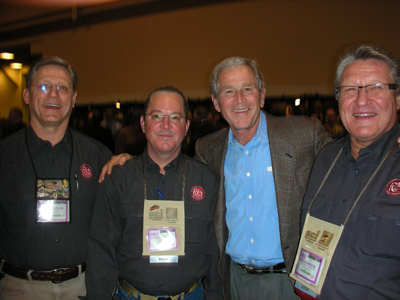 George W. Bush with the Russell Team. L to R: Joe Gonyo, Doug Herge, and Richard Sanders. 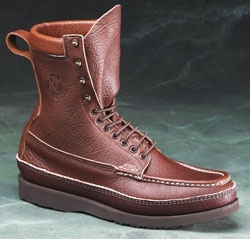 After Doug Herge, the same man who measured my feet when I visited Russell’s headquarters last year, squatted to take the measurements of the former president’s feet, W. walked away with a pair of Russell Signature South 40 Birdshooters. A fine choice, by anyone’s standards. Thanks, Mr. Gannon, for the head’s up. if you are looking for an idiot to wear your boots!